Anna. Thank goodness for extremely dorky princesses who like to settle things on their own! That moment when she turns away from Kristoff to save her sister, and later when she stops Kristoff because she can very damn well punch Hans on her own. Hell yes! Anna isn't perfect and she doesn't try to be, which I think is a great message. Kristoff. AKA The Valiant Pungent Reindeer King. Thank goodness for extremely cute and quirky romantic interests. As a kid, he adopts a reindeer as pet, talks to him, and rides him like a horse. As an adult...he still does all of the above. Elsa. I loved her characterization and it mostly has to do with the metaphor of her ice being really the result of depression and insecurity brought on by the isolation her parents forced her into. We can’t ignore problems, or suppress them. We have to deal with them. Sven and Olaf. I want a pet reindeer too. A real one. Or a plushie. And I agreed with Kristoff, someone needed to tell Olaf about summer and snow and what happens LOL. But hey! He got his own flurry! Music. 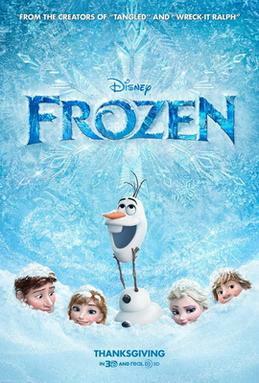 Like all Disney movies, Frozen comes with a wonderful set of catchy songs that will either have you singing, dancing, or both as you watch it. Aside from the main songs, I really liked how they tried to assimilate the background music with the setting. Arendelle is a Nordic/Scandinavian city, and the music certainly tried to match that. Like the icemen song. Metaphors. The ice in someone’s heart represents isolation and rejection, and the only way to thaw it is with love. Elsa’s out of control ice magic lashing out at everyone was because she didn’t receive enough love and thus only knew coldness. Oaken. He is the owner of Wandering Oaken's Trading Post and Sauna who insists on offering his guest the Big Summer Blowout Special in the dead of winter. You gotta understand the man. He's gotta feed his four kids and husband. I applaud Disney for taking this direction. Family is family. Hans. It’s not that I didn’t like him as the villain. He was fantastic! All pretty faced and willing to help, and then sweetly backstabbing Anna. What I wish he'd gotten was a teensy bit more character development, because it felt like he was evil for evil’s sake. Like, boohoo he has twelve brothers and he only saw usurping a throne as his only way, but what drove him to that? Did his parents not give him enough love like what happened with Elsa? Did his brothers pretending he didn’t exist for two whole years affect him way too much? We'll never know.